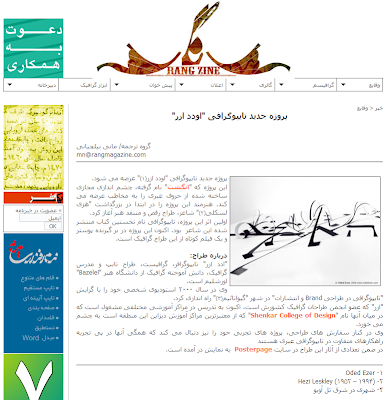 Despite being The Finger a creation of an Israeli typographic artist, logo and type designer, despite the fact it clearly corresponds with ancient Jewish culture - Rang magazine, an Iranian ezine for graphic designers, could not have avoid it and recently published a follow up story about it (screenshot below). Well, yes, art is meant to be borderless but not always is. The Finger consists with a short formalistic movie - practically a slow and beautiful taken travel shot of what seems like a 3d model of the Hebrew word האצבע (Hebrew for "The Finger"). Directed by Oded Ezer the movie is accompanied by a poster (shown top on this article) which was designed and photographed by the artist. According to Ezer The Finger was created as a homage to the Israeli poet Hezi Leskley and is titled after Leskley first book, published in 1986. Leskley was also a talented choreographer, an art critic and one of the first homo-lesbian activists in Israel and had died of AIDS in 1994. 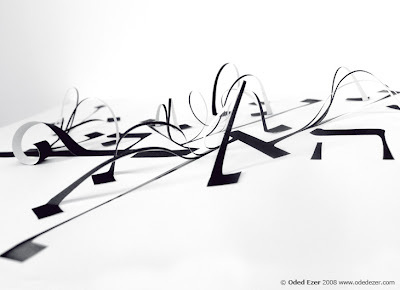 Ezer is a top line internationally known artist who's works have been covered by major media channels, described with nearly every possible superlative from "emotional and powerful" (Die Gestalten Verlag) to simply "fascinating" (The NY Times). 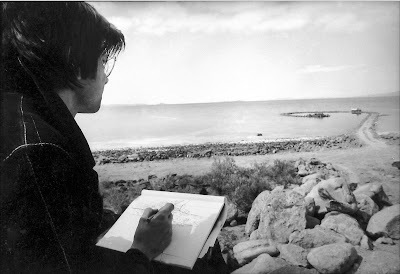 He has won many local and international prizes, including the Gold Prize at the international design competition of the Nagoya Design Center, Japan (2000); Certificate of Excellence at the 4th annual competition of the New York Type Directors Club and Certificate of Excellence at the "Bukva raz", a type design competition, Moscow, Russia (both 2001), and the Israeli Education Ministry Prize for Design (2003). 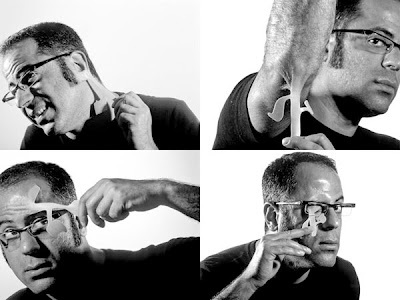 Above: "Implanting Hebrew letters into my body" (as was shown on the Berlin talk). The Finger by Oded Ezer from www.odedezer.com on Vimeo. Nature means chaos. Art is about order and meaning. Nature is opposite to culture. Art, along with philosophy and science, is culture's breath. Nature sets borders for civilization. Civilization destroys nature. 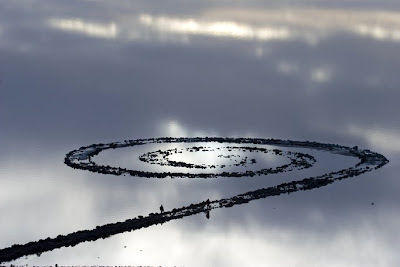 While the two concepts of "art" and "nature" seem to oppose each other by definition, nature is a respected member in the long list of mediums used by humans to express their spiritual insides: it is called Land Art, Earthworks or Earth Art - a sculptural art movement emerged in the late 1960s in the USA. With Land Art creations, instead of sculptures being placed in the landscape - landscape becomes the sculpture itself. The majority of Land Art works are located in distant locations where they are "left to change and erosion under natural conditions." Here few examples to help you figure this out. 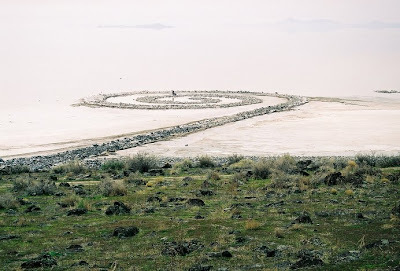 According to Nancy Holt, as quoted in a fascinating NYTimes article Spiral Jetty is a "vortex that draws in everything in the landscape around it.'' The magnificent "vortex" was covered by the water of the Great Salt Lake for many years but since 1999, according to the NYTimes, drought has lowered the water level and in early 2004 it was completely re-exposed. 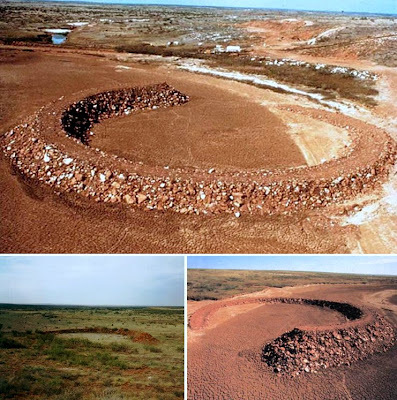 Photos taken in December 2006 and April 2005 illustrate how, same as in the Amarillo Ramp case, the magnificent battle between Smithson and nature is still in process. 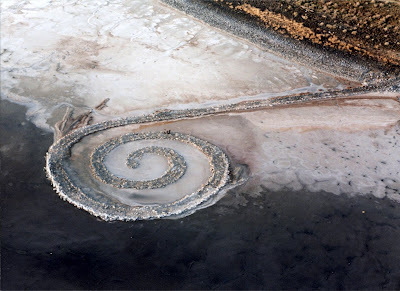 Here is a Google Earth kmz file for Spiral Jetty. Desert breath was completed in March 1997 on a flat sandy span between the Egyptian Red Sea and the nearby desert mountains. Created by D.A.ST – a group formed in 1995 based on the common desire of the three artists to create their own installation in the desert – piece occupies one hundred thousand (!) square meters of desert and involved the displacement of eight thousand cubic meters of sand. 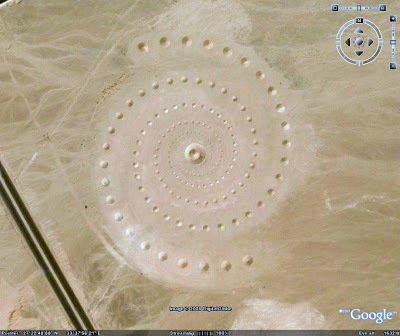 Following is a recent satellite photo of the Desert Breath site and here is a Google Earth kmz file. More about this work by Sculptor Danae Stratou, Industrial Designer Alexandra Stratou and Architect Stella Constantinides on archipedia.org. 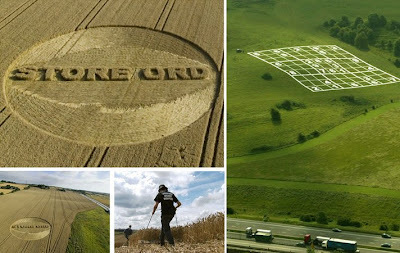 Crop circle making is another form of artistic landscape shaping involving the flattening or cutting of crops to create circled geometrical patterns. This art form become popular over the past 20 years following two Hampshire based artists Doug Bower and Dave Chorley who in 1978 crated a circle in a corn field as a prank. Bower and Chorley wanted to see if they can make people believe the circle was made by a flying saucer. 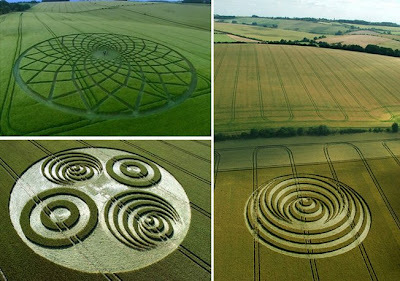 The prank worked well but also attracted countless of followers, headed by The Circlemakers a group of British Land artists focusing in crop circles and other geometrical shapes such as the above. Enjoyed this article? Don't forget to subscribe to our RSS feed! 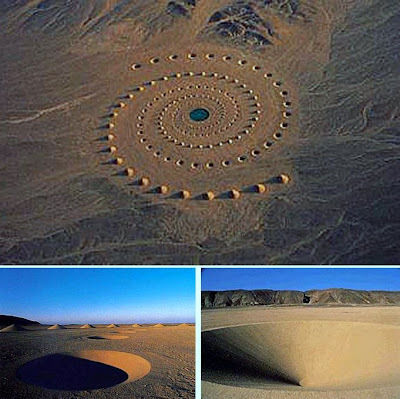 Know any cooler Land Art projects or artists? Be sure to post a comment or let us know here!